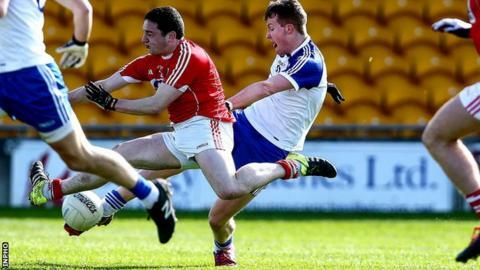 Ulster champions Monaghan suffered a 2-15 to 1-16 defeat by Cork in the All-Ireland U21 semi-final at Tullamore. Peter Kelleher netted for the Rebels in Saturday's clash before the impressive Barry McGinn scored Monaghan's only goal after 12 minutes. Ryan Harkin's goal 10 minutes later helped Cork to a slender 2-7 to 1-9 lead at the break. Monaghan failed to close the gap in the second half and Cork go on to face Mayo in a repeat of the 2006 decider. Having won their first Ulster title since 1999, Monaghan were seeking a place in their maiden All-Ireland final, but despite a strong effort, Cork came out on top. The Rebels registered all of their 2-15 tally from play, as they advanced to their fifth decider since the turn of the century. Cork moved four points clear after 43 minutes before Dessie Ward cut through for a Monaghan goal chance, but the Ballybay clubman fired wide of the target. Monaghan cut the deficit to two points thanks to a Conor McCarthy score, but Cork continued to stay ahead despite strong pressure from the Ulster side. Scores from Seán O'Donoghue and Seán Powter handed Cork a 2-15 to 1-14 lead with six minutes left on the clock. Monaghan fought back but came up two points short as Cork progressed.